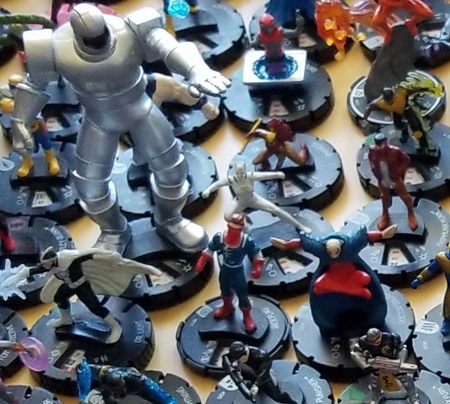 Enter HeroClix, which have been around for years, and which are readily available in bulk lots — perfect for someone who doesn’t care about them as HeroClix, just as miniatures. SMF is specifically designed to work with whatever minis you have on hand (just like Frostgrave, which I love). The best I could do for bulk minis, with some duplicates and likely a few broken ones in the mix, was $0.50/figure on Ebay. Or so I thought, until I remembered that CoolStuffInc — a fantastic online game store I’ve shopped at for years — stocks loose/single miniatures. 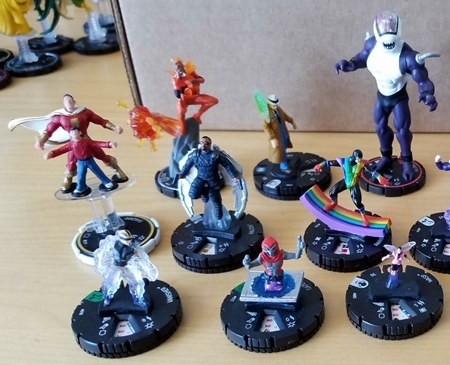 Their HeroClix selection includes batches of 100 assorted HeroClix for $15, with the note, “May contain duplicates.” (They also have batches of 100 different HeroClix for $28, but those were sold out and in any case were pricier than I’d like.) I rolled the dice and bought four packs. At $60 for all 400, that’s $0.15/figure, or $0.18/unique figure — much better than the best I could find anywhere else. And duplicates aren’t a bad thing: Superheroes fight forces of goons, squads of robots, evil crime families, and the like all the time, after all. 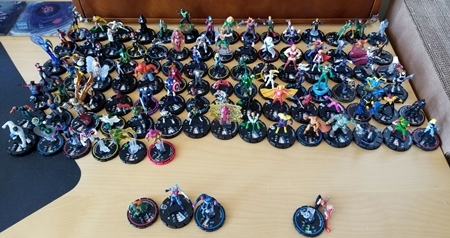 The variety across my 332 unique HeroClix is staggering. A wide range of skin tones, genders (male, female, genderless, ambiguous, etc. ), ethnicities, species, roles, and heroes/villains are represented in my lot. Also included are a dozen or so minis on flying bases, some mundane non-super folks, and a handful of giant-sized figures. Compared to the other prepainted minis I’m used to, WotC’s old D&D Miniatures line, the paint jobs on HeroClix range from awful to pretty good, with the occasional excellent one — but I knew that going in. 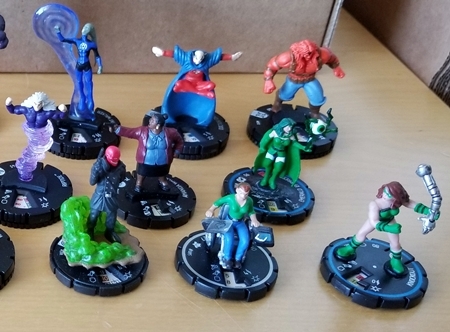 HeroClix get the job done, and what they lack in quality they make up for in variety. 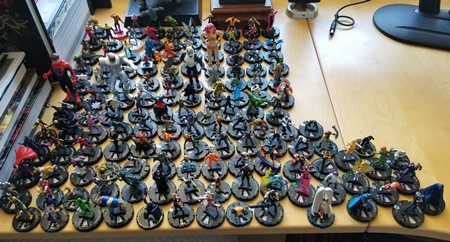 I don’t know of a better way to acquire this many prepainted figures, with this much variety, this cheaply. 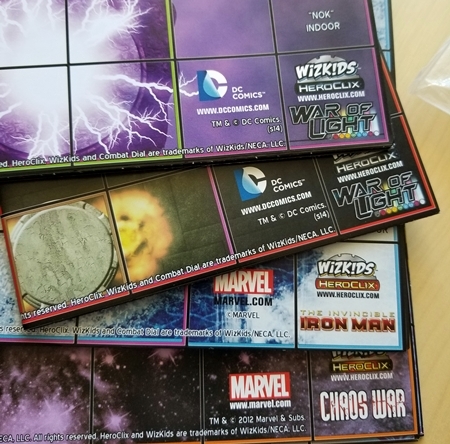 I also threw in a random assortment of $2 HeroClix maps for good measure. Overall, I’m beyond thrilled with how this worked out. When Super Mission Force arrives, I’ve got a deep catalog of potential miniatures to match damn near any character concept we can come up with. I also bought a superhero RPG by the same author, 3d6 Supers!, that looks it will work well with miniatures. I’ve loved superhero RPGs since I was a kid — I’m sure there will be plenty of chances to put these to use. If you need a walloping great bunch of inexpensive superhero minis, this is a splendid option. I’ve played HeroClix and it’s neat, but it’s not my jam. And the older I get, the harder it is to read the tiny icons on the bases. Compared to CSI’s $28/100 different, which shakes out to $0.28/figure, this is the clear winner. I don’t always love using minis in supers games — Marvel Heroic Roleplaying, for example, is superb as a theater-of-the-mind game — but some supers games lend themselves to that approach.